Lasagna rules, but it's generally a) high in calories and b) a mealtime commitment. 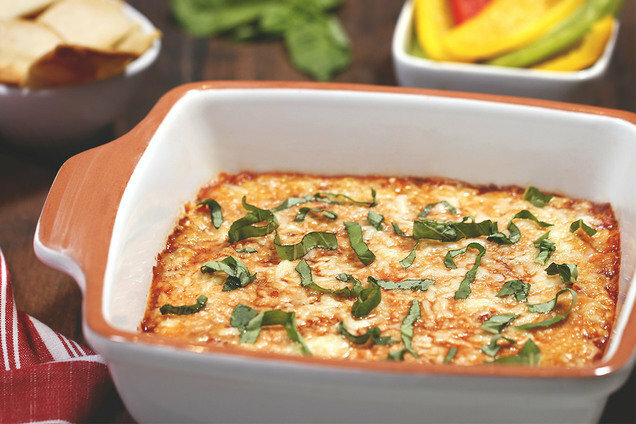 What if you want a low-calorie lasagna fix that you can enjoy as a snack? This recipe is here for you! It's comfort food meets party food... Watch how it’s made! Bring a large skillet sprayed with nonstick spray to medium-high heat. Add beef, and sprinkle with 1/2 tsp. Italian seasoning, 1/4 tsp. garlic powder, 1/4 tsp. onion powder, and 1/8 tsp. each salt and pepper. Cook and crumble for about 5 minutes, until fully cooked. Remove from heat. Add tomatoes and remaining 1/2 tsp. Italian seasoning, 3/4 tsp. garlic powder, and 3/4 tsp. onion powder. Mix well. In a medium bowl, combine ricotta cheese, egg whites/substitute, chopped garlic, nutmeg, and remaining 1/8 tsp. each salt and pepper. Mix until smooth and uniform. Spread ricotta mixture into the baking pan. Evenly top with meat sauce. Sprinkle with mozzarella and Parm. Bake until hot and bubbly, 18 - 20 minutes. Hungry for More Healthy & Hearty Dips? It's almost the end of November, a.k.a. National Pepper Month. Quick, make some Philly Cheesesteak Stuffed Peppers! Everyone will love this recipe... Click "Send to a Friend" now!